I've had people ask me, "Why pigeons?" A few years ago I may not have known the answer. It all started when Francis, a little Helmet pigeon, was picked up by my coworkers at Animal Control. He was with us at the shelter for several months with no interest from potential adopters. 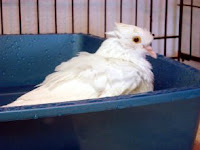 I did a lot of research on the Pigeon Talk forum and several other websites just to properly care for him at the shelter, but the more I read about these wonderful little birds, the more difficult it became to watch a sad, frightened Francis in that tiny cage. 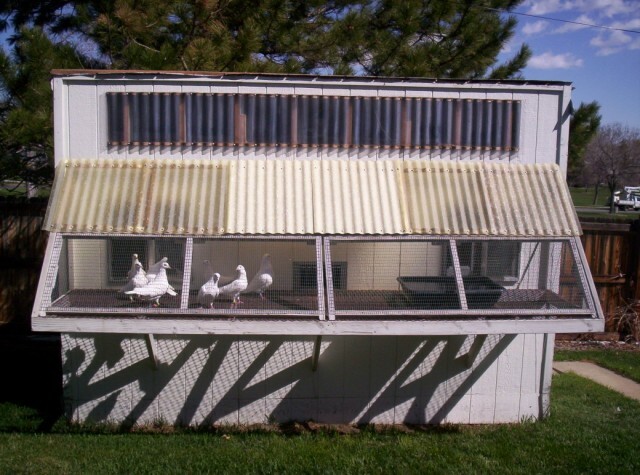 Somewhere along all of the research I read that, in many cases and with the appropriate setup, pigeons can be housed with chickens! 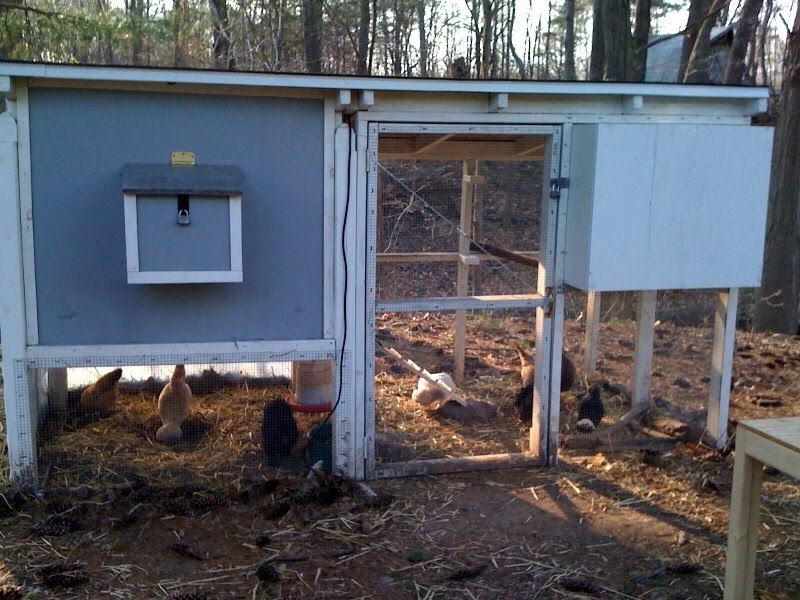 I thought, "Well, I've got chickens and room in my coop... With a few adjustments....." and then it all clicked. I had to adopt Francis and find him a pigeon companion! 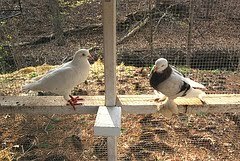 Between Pigeon Talk and the Back Yard Chickens forum, I learned about MickaCoo and all of Elizabeth's hard work to get king pigeons to safety and ultimately into forever homes. I emailed her, went through the process of filling out an application, sent pictures of my coop with its new pigeon accomodations, was screened over the phone and then I was completely overjoyed when I heard that I was approved to adopt from MickaCoo! 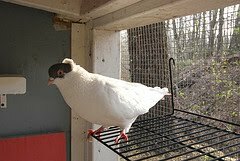 After much thought and discussion, we decided that I would keep a bachelor flock and adopt Austin the West of England Tumbler and Spot the king pigeon. Not too long after, Elizabeth lovingly packed the boys into their shipping box and sent them off to Connecticut. 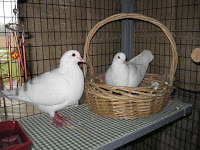 I can only imagine how difficult it was for her, but relief came approximately 15 hours later when I returned home from the post office, two safe, handsome pigeon boys in tow! It's amazing how quickly the boys, now called Mr. Buxton and Speck (all of the chickens and pigeons in my flock are named after Pee Wee's Big Adventure and Pee Wee's Playhouse characters), adjusted after their big trip alllll the way across the country. They were first introduced (each in their own cages near one another) to Francis, who was absolutely ecstatic to see pigeons again!!! He cooed and danced and cooed some more! Later that afternoon, the three of them were set loose into the coop and immediately they were like missing puzzle pieces that belonged here all along. They are wonderful with each other, they are wonderful with the chickens and the chickens don't mind them one bit. 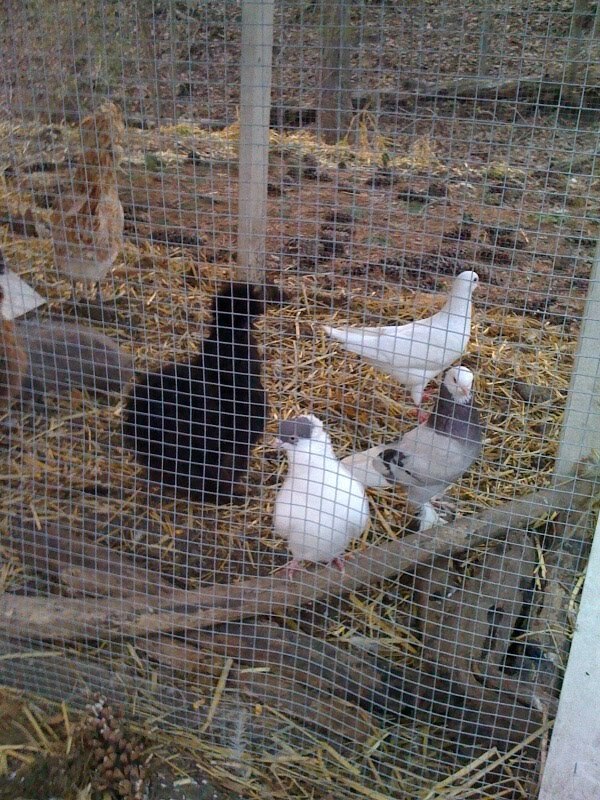 They've even been spotted dustbathing with, eating and drinking with, roosting next to, and preening the chickens! My boys may not enjoy being snuggled, smooched or even handled as many companion animals do, but that is fine by me. They truly are little characters, each with their own individual quirks, personality and loads of charm. 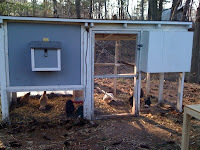 I enjoy laughing at their silly antics and sitting in the coop, simply appreciating their grace and beauty. They're part of our family now, and they belong here with us, forever. So, why pigeons? I can't think of a single reason why NOT. 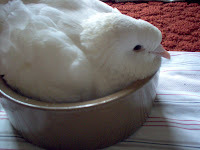 Pigeons need and deserve loving homes just as badly as all other homeless animals do. Well, a home and lots of love are two things I've got, and I am so thrilled to be able to share those things with Francis, Speck and Mr. Buxton. I'd do it again in a heartbeat, and plan on doing it again in the future! Adopted!! Gatsby was part of Phase 3 of the Great King Care-A-Van and on, 3/9 was shipped, with the help of Pigeon Talk member Kari Jo, to her new home in Ohio via USPS. She has been renamed Ciel and she is thriving and much beloved! Below are pictures and a report from her Adopter. March 11, 2009 – the big day…..waiting for the mailman…..he fiiiiiiinally got here, and I’m sure it was amusing for him to watch me scramble out from behind my desk when I spied that big white box he was carrying…. It was like a tryout for Cirque du Soleil. She blinked at me with those beautiful big dark eyes, and I could hardly breathe. She was here. And mine! I haven’t even had my first pigeon, Trooper, a whole year yet, and with the addition of Ciel, [“see yell”, means ‘sky’ in french] formerly known as Gatsby, I’m up to five of them!! I am crazy in love with these birds. I love birds in general, I have a bunch of parrots, and now the pigeons are my ‘thing’, but the kings? I think I’ve found my favorites! This girl spends every minute with me. I own a dog daycare, and she’s been here at school every day since she moved east. We go home, and at night, she sleeps on a special squishy pillow on my bed. After I pet her belly for a few minutes, we both fall asleep with her tummy resting on my hand. She’s learning how to ‘surf’ on the dashboard of the car as I turn corners, but she definitely prefers my shoulder. On the window side. My theory is, so that more people can see and admire her. She’s a lot like Trooper, my first pigeon who was an injured homer, in that whatever snuggling is given out, it’s received with much beak-smacking, and eye-closing. But Ciel takes it to a whole other level….like this is what she was BORN to do!!!! She LOVES to be held and kissed, and pet, and talked to….it’s unbelievable. Probably has a lot to do with the fabulous care she got from Elizabeth and her foster dad, George. I can’t thank those two people enough, for their parts in making it possible for this precious little person to be in my life. After it was clear that Trooper the Miracle Bird was going to live, and be a house bird, I started taking a look at other pigeon breeds and colors, purely out of curiosity. I thought it would be nice to have a pal for him, and Freya, who was a little feral girl from Boston, that had a mangled wing, then came to live at our house. She’s a teeny little thing, but absolutely beautiful----still learning to accept that having a momma is a really really good thing. 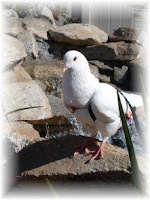 But I kept wishing for a white pigeon….there was just something about them….. 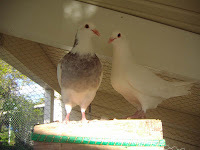 I started reading about the king pigeons in Elizabeth’s blog, and on Pigeon Talk, and my heart just ached for them! So sad and beautiful! I wanted to be able to do SOMEthing to help them, but they were on the other side of the country….what could I possibly do? And then the Great King Care-a-van came to be…….a few months later, my giant sweet girl was delivered to me. I honestly am floored at how much I adore her. She’s pure crystal white with the cutest little coral-red legs and feet, and these eyes that are sooooo dark! In just the right light you can see that they’re a super deep grey, ringed by a dark orange. She struts around my desk, like she’s been doing it all her life, and even though she’s a little leery of all the dogs, she doesn’t hesitate to bust out the beak of death or haul off with a heavy-duty roundhouse with a wing, when she thinks it’s needed. She’s to the point now, in just a week, that she actually will perch on one of my dogs if they’re laying in the sunbeam, so that she can get some sunbeam, too. If Chamois, my greyhound, even lifts her head up to look at her….Ciel’s head goes back and the wing gets cocked back, and Chamois, [smart girl that she is] lays her head right back down. I wish more people could meet these kids. I’ve been taking her everywhere I can so folks can see how amazing they are, and then get one of their own someday! Never in a million years would I have thought about having a pigeon as a pet, let alone getting one mailed here from San Francisco, but ohhhhh, she makes me so happy. There’s just something so sweet about this big beautiful bird, that melts me, when I can scoop her up, hold her to me, and kiss her on her head or her cheek, and she closes her eyes, and just soaks it up….everyone says that Ciel is lucky to have been rescued, and found a good home and a momma that loves her, but I know better. Doll and her mate, Tony, have been adopted via the King Care-A-Van and arrived in their new, forever home in Indiana on March 11th. 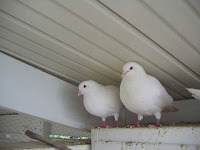 Here are pictures from their new life and below them is what their Adopter says and here is a link to their thread on Pigeon Talk: http://www.pigeons.biz/forums/f24/karijo-amp-anthony-34287.html. They have been renamed KariJo and Anthony. Allen and I live on an acre and a half with a small assortment of critters, which include three little dogs (Renee, LeeAnn, Bear), three pet rats (Stella, Bea, Luna), a leopard gecko (Butter), and a greek tortoise (Kramer) who is a really cool dude. 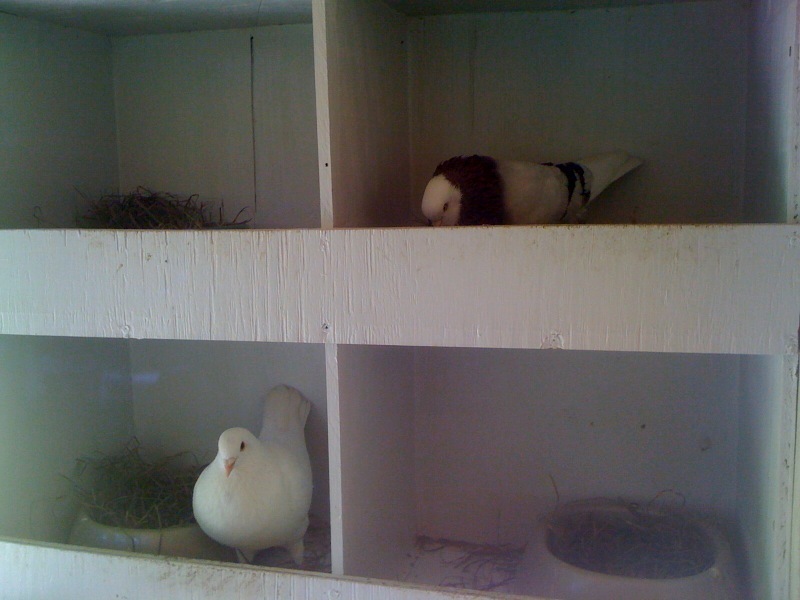 Our little menagerie now includes four pigeons Snow, Flurry, and the two BIG and BEAUTIFUL Kings 'Anthony and KariJo'. Now....I am a big animal lover and grew up around chickens and pigeons which my grandpa had (he lived right next door) and I have fond memories of every summer, my four sisters and I, running barefoot and forever stepping in chicken and/or pigeon poo...so I knew I wanted a couple chickens and a couple of pigeons as soon as we had the room. 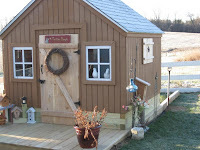 Well last fall we were given a cute little old run down playhouse, a little fixer upper. I'm thinkin "Oh boy, first some chickies then some pijies!" Ya know, FATE is a funny thing. 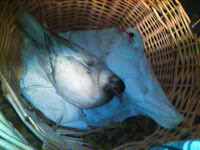 On January 17th after a heavy snow storm and bitter cold, a little white pigeon took shelter on our front porch. Hungry and cold, I put him in a pen in our garage and gave him food and water. I jumped on the computer to research pigeon care and found PIGEON TALK. From there I came across Elizabeth and MickaCoo and the plight of the California King pigeons. I was hooked. When the rescue volunteers started up KING-CARE-A-VAN 2009 I knew I had to try and adopt at least two Kings and give them a forever home. And so it began. After sending an application, a donation, and shipping boxes, waiting two loonngg months, meeting some wonderful people and making new friends, the long wait was over. On March 11th, my two BIG and BEAUTIFUL Kings arrived....ANTHONY & KARIJO! They are amazing white birds with such silly personalities. Every day they will make you smile as they wiggle deaper into your heart. Just like people, some are huggable, some are not....doesn't matter.....they become a part of your family. And it is sooooo worth it! Now with warm weather here, we are working to finish Anthony and KariJo's playhouse and outdoor aviary where they will have more room. Chickens?.........hmmmmmmm. C'MON...OPEN YOUR HEART...YOU CAN DO IT...ADOPT A KING! They say, “A Journey of a Thousand Miles begins with A Single Step”. I believe, that a Journey begins, when you believe enough in your heart to let yourself take that First Single Step. If you would have told me when I was younger that I’d have a house full of animals, I would have believed it. I’m a country girl, born and raised on a sprawling 350 acre farm. Our animals were ALL outside pets. 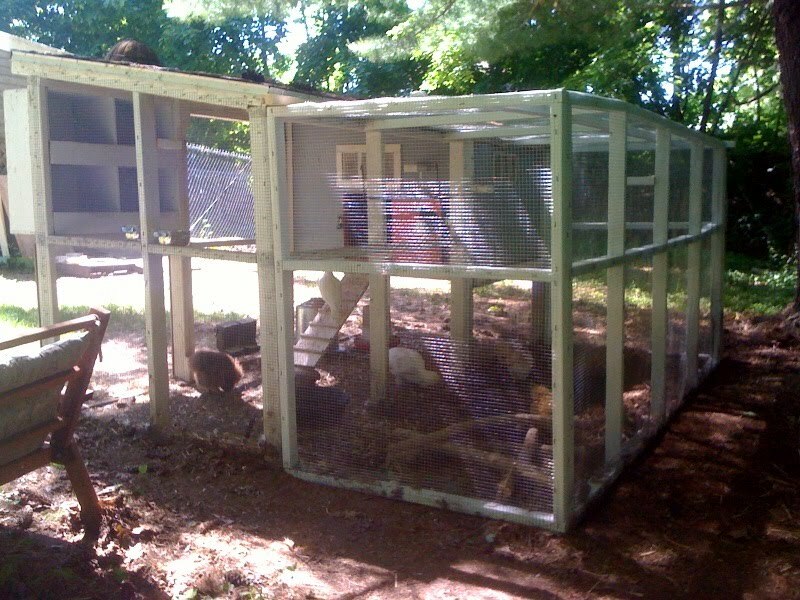 I spent many countless days in the chicken coop or in the barn hanging from the rafters. I was an animal activist from early on, declaring exactly that… one day in the driveway, while Grandpa tried to squash an ant… Uh- huh I said an ant. I saved everything right down to a lil’ ole ant! From that moment on my heart proudly rode around, first class on my sleeve. Some thirty years later my heart still resides in that same spot. And our “Journey of a Thousand Miles” began with my heart in its rightful spot. 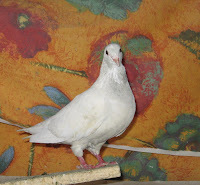 I had been searching for a mate for our house pijie, Willow who had come to us in September 2008. 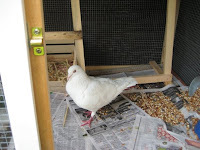 She is a very tame and spoiled rotten, white homing pigeon. After being a member of Pigeon Talk since last December, I was looking through the adoption thread in hopes that we’d find her the perfect mate. On Jan. 12th a thread started that read, “Message To Pij Lovers that Breed” from Elizabeth. I anxiously waited while the thread posted daily about the happenings with what was going on. SO many wonderful people stood up and have taken action. I watched the thread like a hawk and finally at the end of Jan. noticed that someone else from the Southwest had posted. I was ELATED! I immediately talked to my husband and batted every pretty little eyelash I had and asked to be apart of it. He agreed and thought it was a wonderful way to get Willow a partner and save an animal at the same time. I remember typing my response that day, full of hope that this could possibly happen and at the same time I knew that we could only offer one pijie a home. I posted and submitted an application to MickaCoo and waited. A few weeks had passed and I heard on the thread that they were going to be moving on to Phase II of The Great King Care-A-Van and that it was a sole bird coming to Arizona… and I nearly spat my coffee straight out! “ARIZONA…. Sole BIRD??? THAT was ME!!!!!! That bird is COMING TO ME!!! YIPPIE!!!!! !” I was so psyched! At this point the dogs thought I had gone mad… but I didn’t care… I grabbed Keanu’s (our 105 lb Golden Retriever) paws and did A SPIN around the room! Whooo-HOOO!!!!! It was HAPPENING! And it was my BIRD, Phase II is MY BIRD!! We decided that she deserved a name that would represent the thread and her. 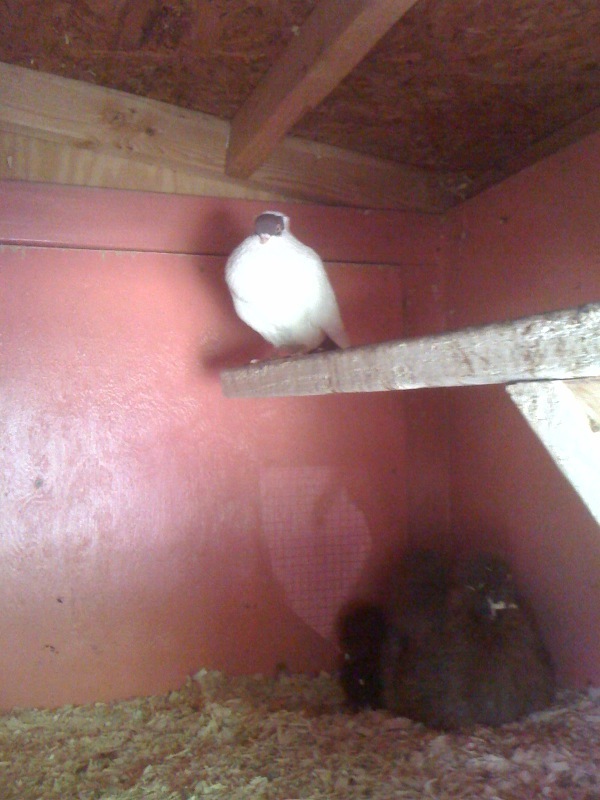 She would be the first King Pigeon from MickaCoo transported by USPS. We had all decided on a date Feb. 23rd and the process began. Meanwhile we decided that since this poor baby at the Marin Animal Shelter being housed in a barn, is a young pijie and she had quite the journey ahead of her to get to us. WHEN it hit…. “JOURNEY” ….. We will name her Journey… With everything she has been through and will have been through to get to us, not to mention the journey Elizabeth began when she made that sole post back in the beginning of January on Pigeon Talk….IT was PERFECT! Journey it was! The days proceeding up to the ship date were wee bit nerve wracking to say the least… Journey needed a ride from the Marin Shelter across the San Francisco Bay to Oakland where she would spend the night at A PT member Kari Jo’s house and then be shipped the next day. It was a 2 hour drive that needed to be donated by the kindness of someone’s heart. I along with everyone else, literally waited on PINS and needles, waiting for a confirmed ride for lil’ Journey… THIS was the only thing holding us back between a shelter and a home for Journey. I pleaded on PT asking anyone and everyone to help… I honestly thought this might not happen after all. Diane, Kari Jo and Elizabeth all kept my spirits up and reassured me that they would make IT happen. The day of the transfer came and confirmation that pijie expert, Dan, had stepped up to the plate. He would make the 2 hour drive and get our precious baby started on her journey. I watched the clock like it was a ticking time bomb…. And I watched the USPS tracking number for her box, even closer. I couldn’t wait ANYMORE… and when I saw that her tracking number had been processed in Phoenix, I told my husband “Come On… We’re taking a drive!”… BY PURE luck or divine intervention I like to think, I found the address that matched the zip code at the loading dock and while everyone at the post office thought I’d gone postal driving over an hour and a half for a PIGEON… Journey was delivered into my hands via Claps and Praises!!! …LOL… I tore into that box like a kid at Christmas… Poor Journey probably thought, “Ummm… Everything ok out there guys?” I popped the box and grabbed my BIG ole BALL of FLUFFY warm white FEATHERS! She was finally home…. She was finally here…… She was safe….. she wasn’t lonely, cold or unwanted. SHE was right where she was meant to be. Home…. safe and sound. My admiration for ALL the people that are involved in the King Care-A-Van, is held close to my heart. The dedication of everyone involved is truly awe inspiring. And for those of us who have opened our hearts and homes for these orphaned Big ole’ King Pijies knows; that the love and security along with the promise of a forever home; mean more than the world to even just one pigeon, who can be saved. I can’t save the world. I can save one; that in which I decide to act upon. From the bottom of my heart, I thank you for reading Journey’s story. It is only one of many that you will see here. Amongst which I sincerely hope to be reading yours next. “A Journey of a thousand Miles begins with a single step”. What will your step be??? 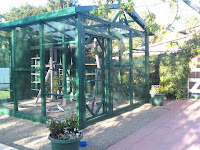 ADOPTING KINGS... My husband built me a huge walk-in aviary for my 15 homing pigeons last year. 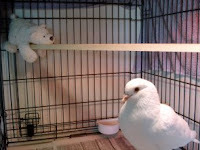 There was a great deal of extra space, so when I noticed ads on Craig’s List or on Pigeon Talk for birds needing a home in my area, I started to respond to them. Taking in homeless birds just seemed like the right thing to do with the space I had. When MickaCoo started raising awareness about the King pigeons in the Bay Area, it was a perfect fit. 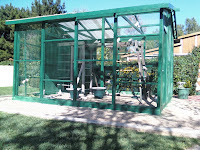 We have just completed a second walk-in flight cage larger than the first where my “flock” of rescued doves are housed. So, after the application process, a generous volunteer from Mickaboo drove six King pigeons (and two more doves for good measure!) all the way to SoCal where they have joined my birdie family. The Kings are slightly larger than homers, and more docile by nature. Because they are less flighty and larger, it almost seems like they have “bigger” personalities to go along with their size. Most are seemingly all white, but many also have dark markings that add to their expression. Dolce has a distinctive black patch on her forehead that she thinks makes her the “Queen of the Kings”...There are pictures of my new family members on Mick-a-coo... I was lucky enough to get Dolce and Macadamia; Alfredo and Amaretto; Charms and Bell... and doves Vanilla and Fudge. 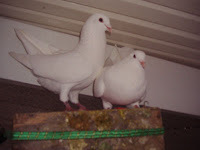 I already have a King pigeon that has been living very nicely with his crippled mate in the main pigeon coop....he came in as a rescue and the owner had named him Yeti because of his size! But these six San Francisco Kings have joined the planned community in the “Castle” and I am excited to adopt three more little squeakers this weekend. So, now each evening I get to walk into their “Castle” and plop down in the middle of the gravel floor and sit quietly as they have dinner and socialize with each other. Every day I am becoming a more accepted member of their flock and it really is a wonderful way to unwind! There are MANY King pigeons needing homes right now, and more arriving in Bay Area shelters all the time. Because I cannot take them all, I am trying to encourage and facilitate their adoption by others who have a place in their hearts and in their aviaries for these wonderful birds. A wonderful family with whom I've been following up since February has finished building their pigeon pen and adopted two kings, Martin & Luther, who were strays wandering in the streets until they ended up in the SF city shelter. They are extremely lucky. 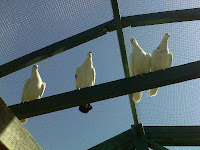 BIG news- a wonderful family with a gorgeous, gianormous aviary has adopted six king pigeons! 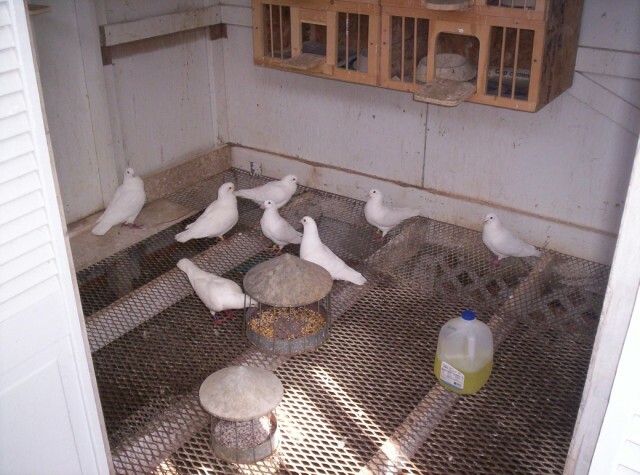 Billie & George, Rome & Opal and Willow & Blue struck the king pigeon lottery (literally) and will live out their lives safe, well cared for and loved. Not bad for a bunch of "meat birds". 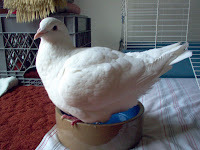 "Luna's new primaries are snow white and almost grown in full--most her tail feathers ditto. Though her head is much lighter it will be 3 months before the molt and complete her transition to a pure white pij. You might see some more weight on her and she is a vigorous preener. Her head has a unique slope and though she started as an ugly duckling her inner beauty will be reflected on the outside by this summer. Luna and #9 are courting and auditioning a new hole in the wall nest. He goes in and moans and she just hangs out and once in a while she will charge in and give him the symbolic love peck. But she is just taking a preening break and when she can get some eggs down later, she will lock onto the nest. Number Nine is a son of the refrigerator hen and I fed him a bunch so he is a bit tame with me and he is a big boy--as big as Luna---typical Blue Check pij but flawless." 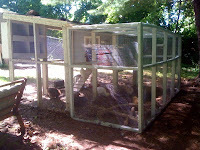 "All the new kids seem to be enjoying their new aviary and get along with everyone! No fighting at all. 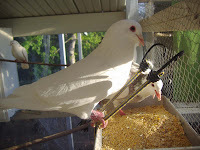 These king pigeons are wonderful social birds and would be a pleasure for anyone to have in their aviary. We enjoy just watching them interact and admiring their beauty. It may seem crazy but, they add so much to the farm." "The Kings have adjusted so well! 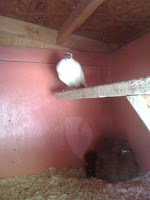 They seem to be peaceful harmonious birds that do not generate a lot of arguments in the coop. Their large size in comparison to our other birds is constantly amazing. They have paired up with a loyalty to each other that is endearing. We thank Elizabeth for her giving, resourceful efforts in finding homes, and bringing four of them to us!" 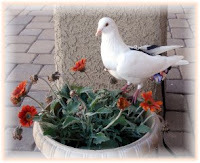 "Gurumina is a lovely bird with quite a presence. When I first brought her into my life, she was a bit apprehensive and very gentle. After she became more accustomed to her surroundings, her real personality came forth. She is a queen! SHE comes to you when SHE wants to be scratched and does not tolerate intruders in her cage. (I've made the mistake of petting her when I wanted to and was rewarded with a swift series of pecks on my hand.) She has a very swishy walk and twists her neck in very strange and awkward positions. Elizabeth told me that this has to do with some problem she has with her eyesight. Her quirks add to her presence. She is very quiet when she trots around the house and enjoys standing in front of the hallway mirror and preening herself the most. Since she wears a diaper, the mess she makes is minimal. I am very glad to have Queen Gurumina's presence in my life and would recommend a pet like her to anyone who enjoys animals with personality."